Experience the fun of flying down the hill at top speeds, even if you’ve never learned to ski. 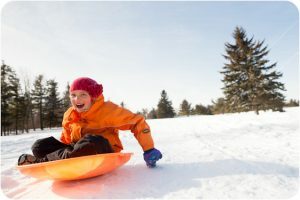 Bend is home to Wanogo Snow Play Area Sno-park, as well as a number of great locations to grab a sled and enjoy winter with the family. Let your little one cruise solo style aboard this youth sled or grab one of our larger adult sleds and ride with them! What better way to pull the kids off their tablets and out into the sunshine than zipping down the snow covered hills outside Bend Oregon. Sledding is the perfect balance of exercise, smiles, and laughs!